A Marketing/Augmented Reality Internship Update. "My name is Michal Bodzianowski. I’m a senior at STEM Highlands Ranch, but have been taking my classes off-campus at CU Denver for the past year or so. I came across Panther while I was looking for an internship program to be part of. Mr. Shall (STEM Engineering Instructor), reached out during this time oddly enough asking various students whether they’d like to do an internship over the summer. I was definitely interested and before I knew it I had an interview scheduled with Mr. Dow (Panther Industries President). I wasn’t sure which internship position I really wanted to do, so I applied for both the marketing and the R&D internships, and I eventually got marketing. When I got started I met David, the new head of marketing and he gave me a bunch of assignments ranging from doing some social media work to writing up a report on the marketing strategies of our competitors. Since then, I’ve moved on to other various projects. One of the projects I’ve specifically been working on, and am proud of, are these internship updates. I was in charge of interviewing the various interns and creating these types of blog posts - including this one. It’s a bit awkward since I can’t really interview myself. Since I had some extra time this summer, I also used my programming skills to join the Augmented Reality project alongside Ethan. We managed to develop both an iOS and Android application throughout the summer, so we also got a taste of just how challenging app development can get. It was a great learning experience for both ourselves and Panther. I really enjoyed working on the Augmented Reality application as it really tested my skills and working with Ethan was great, I think that collaboration and cooperation with someone equally as skilled was really fun. However, that’s not to say that the Marketing side was boring either. Doing these interviews in fact was really nice as I got to learn more about the rest of my peers and their experiences over the summer. And doing some of the other content creation for our other social media platforms was definitely exciting. The toughest challenge by far has had to be either getting the Augmented Reality app working on both iOS and Android, or writing up white papers for marketing. The former was tough in a more technical sense - the challenge was to be able to deliver for two very different platforms without doubling the amount of work in doing so. Eventually figuring out a system and working to build it, then having it actually work, was really satisfying. On the other hand, writing a white paper was a much harder creative challenge than anyone I think would expect out of a white paper. Before I could even start writing, figuring out the direction the white paper should go and have the best impact took a lot of research, brainstorming, and careful planning. And unlike the app, there’s no way for me to say that the white paper is really effective until we publish it, and even then it’s not so black and white. So I guess we’ll just have to wait and see! I’ve always been looking forward to using technology and computers to the maximum extent in my future work. I believe that there is still a lot of untapped potential in technology that can be used to revolutionize, or at least, revitalize many aspects of our society today. Ultimately, however, I’m not sure exactly what I want to do. But this Panther internship has definitely given me many more tools to help me achieve what I eventually would like to achieve. I have never taken a business or marketing class before, so the Marketing aspect really helped me achieve some of that valuable business sense and marketing savvy, while the Augmented Reality aspect helped solidify the programming concepts I’ve been taught at school into a working application. Overall, I’m glad I spent the time at Panther this summer. Not only has it given me something to do instead of being lazy all day, I’ll be able to come out of it a more capable person, ready to tackle the next challenge in life." Thank you for reading my Internship blog posts this summer. You can read the rest of them here. "My name is Rois Baker and I’m a sophomore in high school. The first few weeks of being here at Panther were difficult for me because I was never part of the STEM or IT group at my school. I came across this internship because of my dad, and he thought it would be a good opportunity for me to get into the industry and see what I wanted to do after college and high school. I first started working on putting together mainplates for the applicators, so I was just getting them started so the other techs could finish and program them. And then as time went on, it started going from assembling these main plates to other parts of the applicators, then the print engines, and then other parts. I also programmed print engines and made mainplates when they needed it, helping out where I could. Doing this stuff at first was pretty challenging because it was all new to me, but it definitely got easier as I did it more and more. I got a lot of help from the others working with me, which made it easier to build the machines I was working on. My toughest challenge has definitely been wiring, because I was not tech savvy before I came here. I had to learn everything from the bottom up. I ended up enjoying wiring because it was so challenging, so it kinda went hand in hand. I’m not quite sure what I’m looking forward to doing in the future yet. There’s still a lot for me to figure out. This internship did help point me in a direction I want to go, but I’m still not sure whether the servicing side is for me. I’m now kind of interested in trying out the business side of the industry, which might be a little bit better for me. So really this internship did is give me some good perspective and helped me figure out that I can go on different paths with my life. It was really fun too. I learned a lot of useful stuff, not just in the industry but life in general as well. The people I worked with were really cool and I’ll definitely be back here at some point throughout the year." Read more about Rois and the other Interns here. Back when Shaun was starting off his internship at Panther, he was tasked with various projects to become familiar with the tools and machines used in the industry. One of the fun projects he got to experience and build was an interactive basketball game. In this video, Shaun explains the process - and challenges the other interns while doing so. Read more about Shaun and the other Interns here. Produced and Published by Panther Industries, Inc.
Panther is proud to partner with STEM School Highlands Ranch for its internship program. 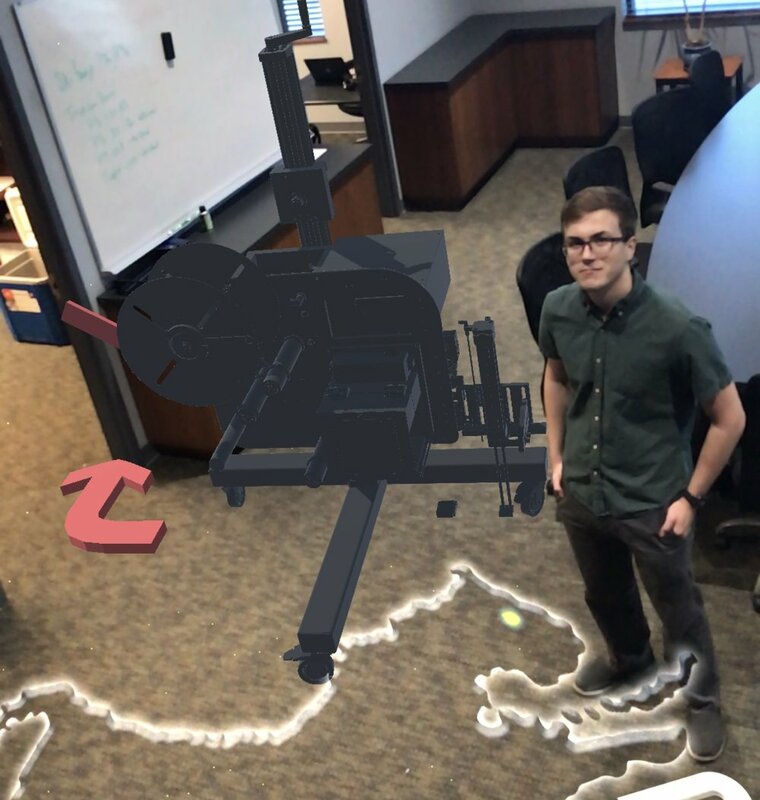 An Augmented Reality Internship Update. "My name is Ethan Montgomery, I’m the Augmented Reality intern headed into my Junior year. I found out about the internship opportunity when Mr. Shall (STEM Engineering Instructor) put me in contact with Mr. Dow (Panther Industries President) after he saw my experience with augmented reality. One thing lead to another, and eventually from that Mr. Dow gave me a job developing an augmented reality app for Panther. I started off really excited, and despite my experience I still didn’t know too much about augmented reality, so I definitely ended up learning a ton. A ton about working for a company as well, which was new for me. I worked on a prototype for the first three to four weeks. Panther wanted to figure out whether or not the concept was worth pursuing further, which it luckily turned out to be. Afterwards, we kept developing the app, and eventually ran into a problem with our tracking solution. We started with the camera recognizing separate images, and from that the app knows where to display the 3D model. Since then we’ve changed it to where the camera sees the entire world around and generates a 3D plane of where the floor is and where the walls are, and from that, the 3D models can interact with everything around them. We ended up changing it because the app would only work when the images could be properly detected. This caused a lot of problems, because often the conditions would not be ideal and there would be a lot of stuttering involved, which was really distracting. By switching to detecting the floor, everything became a lot more stable. I really enjoyed developing the app, working with everybody, and learning a ton about augmented reality and software development. Really though, just being here was awesome. The toughest challenge was really getting the augmented reality to actually work. Getting the camera to track the images – and obviously we moved away from that method – but then once again getting each and every component, the camera, the phone, etc. to understand the world around it and interact correctly with it took some time and effort. The internship has taught me a lot about software development, especially with augmented reality, and its also taught me how to carry myself in a workplace. It has definitely helped because I’ll probably be doing similar things when I’m an adult. So I guess this was kind of a dry run, or practice for that. But just getting to work with this technology very extensively has helped me get ready for doing more stuff like this in the future. Panther’s a great company, and I loved working for them. I learned a ton, and everybody’s super friendly. I’d highly recommend anybody to apply next summer for an internship. I couldn’t really ask for a better experience." Read more about Ethan and the other Interns here. "Hello, I’m Shaun, I am an intern here at Panther doing part time R&D (Research and Development) and sometimes part time service. I actually found out about the Panther Internship through STEM School, which is down the street on Barrons Blvd. Our engineering teacher, Mr. Shall, sort of approached me and asked if I was interested. I thought the deadline was already gone, but he made it work, and I got an interview and now here I am. The first few weeks were pretty good. I worked a little bit down in the service department and made a few machines. Then for the most part after that I went upstairs to the R&D office and started working on learning structured text and other IEC standardized programming languages. Since then, I’ve been exploring new options for different motors that we can use and how to control them. I’ve also been exploring the possibility of connecting some of these machines to the internet to interact with online APIs and get information through those methods. I’ve really enjoyed the opportunity to learn this industry and figure out the ins and outs of production and making automation equipment. It’s something I’ve been fascinated about all my life – automating things, making things talk to each other, and work with each other. So this is definitely a great opportunity and definitely enjoyed being here. The toughest challenge for me so far has been actually getting the machines to connect to the Internet. I can get them to connect with no problem, but then I can't use the data I get back. And I’m having to make a lot of my own replacements for built-in functions from those non-Panther code libraries that really should already be there, but aren’t. One thing I’m really looking forward to right now is learning how to use industrial PCs and how that application layer communicates with the physical layer. You can compare that to a Raspberry Pi computing device: our current PLCs (Programmable Logic Controllers) are Arduinos and an industrial PC is a Raspberry Pi, if you get what I mean. So it’s gonna be really cool to see how that works and how to really make use of that. Before coming here I wanted to be a web developer or server administrator, but now I’m actually seriously considering changing where I want to go with my future. It’s because I actually really do enjoy building these machines and making things that automate a given task. I just find it interesting, because it’s a little bit of everything - it’s a little bit of the software layer, it’s a little bit of the physical layer. I’m sort of well-rounded, so I don’t really just focus on one specific area. As an example, I love coding websites but I hate making the graphics for them. And this internship just strikes a nice middle ground between those two things, making it feel close to being a web developer - but with just a bit less reliance on graphics." "I’m Truman Giesen, and I have been working with Panther since last summer where I was part of their first year of interns. Last summer I worked upstairs with Joel in 3D Design, and this year I’m actually assembling the machines downstairs in the workshop. In the first few weeks this year we mainly went through a lot of groundwork, like getting to understand how the interns fit into the overall scheme of the service department. Since I've worked with Panther before, I already kind of had a base understanding of the machines and how they’re assembled. So my internship so far has really built upon that and has given me a much deeper understanding of these new concepts while providing me opportunities to learn more in depth about what I already had known. Lately we interns have been given much more freedom and independence. We’re working with other interns in addition to full-time employees, and I feel like we’ve been given more respect and more trust with the machines. We’ve also been allowed to do more in-depth assemblies than before, and we’ve branched out to do other things. For example, I was taught a little bit of the programming of the machines, so there’s a lot more to the service internship than just putting a few screws in them. Before Panther, I had a good understanding of assembly, a good understanding of hardware, so putting together the machines was just kind of base knowledge for me. I know how to use a T-handle wrench and I can find the right size hardware. So what really is the hardest part of the internship for me is the electronics. Cutting, stripping, and labelling wires: they’re all something I did not have much experience with before coming to Panther. It’s all a new aspect for me , and it’s been a struggle to learn. But when you finally get it right, it’s very rewarding to see a machine power on with your wiring inside. In the future I’d like to do more programming. The little bit that we touched on was a lot of fun, and I’m hoping I get the chance to program the whole machine. It is a lot more intricate than anything I’ve done so far, but being able to work with actual code and to have something that I made continue in all of the Panther models instead of just the ones that I build would be really cool. I think it would be a lot of fun to try to figure out a challenge like programming something so intense. Ultimately, I’m really glad that I’ve been given this opportunity. Last year when I signed up they only took three interns, and while they have taken more this year it still could have been extremely difficult to get the position. In the end I’m just really glad that I got the opportunity because its given me new horizons and actual experience in fields that I would like to go into in the future. It's been an amazing experience, and I’m super glad that I am a part of Panther’s team this summer." Read more about Truman and the other Interns here. An Update from the CAD Intern. Hello, my name is Charles Burroughs. I am the new Engineering/CAD Intern. This previous year in high school, my junior year, I decided to sign up for the CAD class. I got the hang of Solidworks very quickly. At the end of the semester I took the certification test and I passed. I then signed up for the Advanced CAD class and towards the end of the year. Mr. Shall told me about an internship opportunity at Panther Industries, and so I investigated it and got an interview set up. The interview went very smoothly and the person who I was interviewing with was very friendly and easy to talk to. I made it to the second round of interviews with Joel Lessard and Shaw Bradford. They were also very friendly and were interested in learning more about me and what I wanted to do in the future. I was very grateful to receive the offer letter and I accepted. I was very excited to learn more about how CAD was used in the real world and very excited to start. Throughout my first 3 weeks, I have learned a lot. I have learned more about how the engineering aspect of a company goes into the manufacturing of the company. I have learned a lot about what engineers do in the real world. I have already started to design some of my own parts and solving problems from other parts. Not only has this internship taught me more about the real world of engineering, but it has also taught me about everything that is done for a normal job and business. It has already helped me in the future. I am very grateful to have this opportunity to work at Panther Industries and learn more about engineering in the real world. I can not wait for everything that I am still yet to learn from Joel Lessard and Shaw Bradford. Read more about Charles and the other Interns here. Panther Industries is pleased to introduce the new students that were selected to participate in our current internship program. These individuals will be participating in real-world business experiences – from engineering to manufacturing to marketing – to support their current and continuing education efforts. Panther is honored to partner with local schools and have these incredible students work with our company. Please check out what they have to say so far! "My name is Charles. I’m actually very interested in cars, so I would like to go for an automotive design or mechanical engineering degree. I took a CAD (Computer Aided Design) class recently at school, and Mr. Shall, a teacher there, told me I could get an internship at Panther. So I decided to look into it and I got the internship, and now I am using CAD to basically do everything that I would have done in the automotive world, except it’s in a different setting and I’m getting exposure to the CAD world as well and everything they do with it." "My name is Ethan and I’ve been the augmented reality intern here at Panther for about 5 weeks now. I’ve been utilizing augmented reality for around three years, and now I’m developing an augmented reality support app for Panther." "I’m Henry and I’m one of the service interns at Panther. I’m really interested in mechatronics which is the industrial application of robots, and automation as well. It’s really cool being able to learn how these machines work, about the pneumatics and mechanics of it, learning how applicators are made, how to apply labels, about vacuum sensors and vacuum boxes and stuff." "My name is Josh. I’m completely new to this. I really haven’t had any experience with hands-on work before, and I joined Panther to sort of get that new experience in my life, and also to understand machines better and become more of a handy person when I go off to college. I’ve always been fascinated with machinery, and the way things run in a business and production line, so Panther has really given me an outlet to experience that first hand." "I’m Michal. I’m a very avid programmer and naturally I really like working with computers and building them as well. I decided to join up with Panther as I really wanted to get more working experience inside a business. It might be a bit surprising that I ended up doing Marketing, but the role actually requires a lot of experience with website design, social media, and graphic design, all of which being something I’m familiar with and enjoy doing. I’ve only been with Panther for a few days, but I hope the internship continues to give me new challenges to tackle every day." "My name is Rois, I play baseball and go to Dakota Ridge High School. I decided to get interviewed for the internship at Panther because I was interested in all the machinery and how it works. I’ve always wondered how they put the printers together and stuff like that. The internship is going pretty good actually and I’m learning a lot, and I’m having a lot of fun too. I’m basically assembling print-and-apply machines. I’m not putting together all of them, for example I’m not doing the wiring but instead I’m putting together the main plates and the mechanical parts of it." "I'm Shaun. I have always enjoyed automating and making different devices talk to each other, and so I really enjoy the Panther internship. I get to go up to the research and development room and make different machines cooperate, figuring out how exactly to make them communicate so they can automate tasks, which would otherwise take a much longer time for us to complete." "I’m Truman. I’ve always liked making things and knowing how it works, so getting to work at Panther where I get to build machines, and even learn how to program them is really cool. Just getting to see the other side of the machinery I’ve always been intrigued with is definitely a great experience." I have just completed my internship with Panther Industries. I learned more than I thought I could during my time here. My experiences ranged from designing new parts to running machines in the shop. Panther Industries gave me the opportunity to do everything an engineer does. As if that was not enough, they helped me improve in my people skills and made me feel valued in the workplace. I started this internship with a SOLIDWORKS associate, high school lab experience, and a desire to learn. When I started I was given simple tasks such as correcting technical drawings. After about a month I was presented with new challenges. I began to work with parts and assemblies. The mechanical engineer Joel Lessard showed me how to properly express the ideas represented in exploded diagrams, consider a complex set of variables when designing a part, and ultimately what it meant to be an engineer. Learning continued to be an everyday activity. As I continued learning more tasks were placed before me. I was given the task of designing a new method of displaying the machines. This involved designing and implementing a solution to better display and demonstrate machines. I worked with parts from 8020 and the machine shop’s capabilities to complete the solution. As my experience continued to grow I was even given the opportunity to work in the machine shop. I prepped two sets of tamp heads and aluminum blanks for a bracket. The next week I ran CNC Machine that made the blanks into mounting brackets. I finished in the machine shop by finishing the tamp heads that I had started. All in all, it was a cool experience to work in the shop. Panther Industries has left me with nothing to ask for. They guided me and helped me to grow not only as a worker but a person. I want to give a special thanks to Joel Lessard for guiding me and nurturing my skills through this whole internship. I went from knowing what drawings were to designing and implementing solutions with his help. I also want to thank vice president Mr. Dow. He was always friendly and made it clear what I was doing right and what I could improve on. I feel much more prepared for the professional world because of his direction. Panther Industries has been great to me and I am sad that I have to go. I appreciate everything and have nothing but great experiences from them. I am now a little bit over halfway through my internship with Panther and my experience has been nothing short of extraordinary. Since the last time I wrote about what I was working on at Panther, I have been given the opportunity to complete numerous endeavors. Instead of seeing what an engineer does, Panther has given me the opportunity to experience what it is like to be an engineer. I have completed projects that encompassed all of the steps of the engineering process. Starting from a problem to refining a solution. To begin with, I was able to come to a conclusion with the R&D printers. I designed a new set of rollers for the printer to ensure that the label did not get crumpled or jammed while it was passing through the printer. I designed the brackets in SOLIDWORKS, 3d printed the brackets and implemented my solution. My first solution was not working. This is where I got to complete the full engineering process and refine my design. My second design outperformed the solution that the manufacturer sent us. This was something I was proud of and excited about. I was very thankful for the support that I was given by Mr. Dow to get as far as I did on that project. Additionally, I designed a part and numerous drawings for Panther’s new machine, the Panther Predator P9. With guidance from Joel Lessard, I created a bracket for the new P9’s pneumatic cylinder. This bracket mounts the cylinder and tamp head to the machine. After that, I worked with Joel to create the drawings for the subassemblies of the P9. This continued what I learned during the first quarter of my time here. I was able to further explain how to help machinists and customers understand the applicators we make. The learning curve has been steep. Almost every day has been a new challenge. Even though the struggle I never felt at a loss. The staff at Panther were behind me at every step. Learning and improving has become an everyday experience for me and I love it. I came to Panther to see what an engineer did, but now I know what it means to be an engineer. I am completely content with everything I have learned so far. I am excited to see what I learn next. Over the past few months, I have had the privilege to work at Panther Industries for a school project. Going into the new position as an unpaid intern, I had my fair share of reservations about the work I would be doing. Figuring that almost all of what I would do had some aspect of handy work; something I had no exposure to growing up. However, the field technicians are incredibly helpful and open to aid you in any way possible. I’ve learned many new hands-on skills ranging from the types of hardware (why they are used in certain situations), assembling mechanical components, and even wiring electrical control boxes. Panther's process of first showing you the ropes on building the various labeling machines, then allowing you to recreate the process on your own, was very beneficial. The philosophy of experiential learning, combined with a supportive company culture, produces an engaging and exciting work experience that I would recommend to any of my peers. Alongside the technical skills you are exposed to, you are also taught integral group work skills. While many of the current professions offer a competitive “Me first” environment, Panther flips that stereotype on its head and fosters group based tasks. The soft skill of working together with your peers to accomplish a task is a rare one these days; luckily, I’ve found a place where I can truly grow and learn plenty of new things. I have thoroughly enjoyed my time here, and can not wait to spend more days working with the team at Panther. My name is Mae Wright and I am a senior at Arickaree School out in Eastern Colorado. Because I live in such a small community, there is a limited amount of opportunities like internships, job shadowing, and large business experiences. Arickaree had some contact with STEM School Highlands Ranch and some of the staff came down to my school to see just how much our students knew about the way STEM works. I was one of the three students asked to attend the meeting. Honestly, until they explained it, STEM was just a word to me. The staff was interested in three of us and asked what we saw in our futures. It took me a while to think of what to answer, because normally when people ask you what you want to do with the rest of your life, you reply with the generic doctor, lawyer, astronaut, or firefighter. None of those options made sense to me, so I went with my gut and told them that accounting was my passion. This must have sparked something in their minds because within the next couple of weeks, I got asked to attend an internship at Panther Industries up in Highlands Ranch. I couldn’t believe that it was happening to me, a small-town farm-girl. Of course, I jumped at the opportunity and spend three days up there. Throughout the three days, I was placed with an extraordinary host family and learned very helpful accounting skills through Panther's accounting department. Bridgett Owen amazed me with her work ethic and organizational skills. She taught me the accounts receivable aspect and took me step by step through the process from start to finish. I am a visual learner, so when she gave me examples to look at, and when we talked to other co-workers in the building, the information clicked. I also worked with Jill at the front desk, who taught me about the accounts payable aspect of the business. She showed me how to pay bills, reconcile, and pay taxes. I learned a lot through this job shadowing experience and it enhanced my drive to still pursue my dream of becoming a bilingual accountant. If the opportunity arises for someone in my rural community to participate in an internship or job shadowing experience, I would tell them to go for it. Once-in-a-lifetime opportunities like this don’t come around that often, so if there’s a chance to get involved in something like this, don’t hesitate.